Members of Parliament have voted to scrap presidential age limits. File photo. The ruling National Resistance Movement on Wednesday garnered two-thirds majority as members of Parliament voted for the second reading of the controversial Constitution Amendment Bill No. 2 (2017). The voting that lasted two hours saw 317 MPs vote in favour, 97 against while two MPs abstained. This implies that Parliament has voted to amend the Constitution. The MPs were supposed to vote yes, no or to abstain. Mukitare Birahwa, the Buliisa MP, Masindi District and Mr Pius Wakabi Rujumba, the MP for Bugahya County, Hoima District abstained. 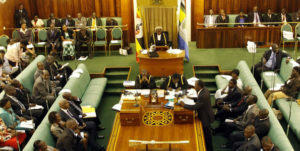 “With 317 voting in favour, therefore, the motion must be carried forward,” Speaker Rebecca Kadaga ruled as she referred the bill to the House committee for further scrutiny. There were some surprises, however, as former Forum for Democratic Change loyalists; that is Bukedea Woman MP, Ms Anita Among and Ms Beatrice Anywar of Kitgum Municipality voted in favour of the bill. The two, now independents, until early this year, were critical of President Yoweri Museveni. The bill tabled by Igara West MP Raphael Magyezi is intended to scrap the age limit for presidential candidates.